Those little Facebook Videos have done it again. 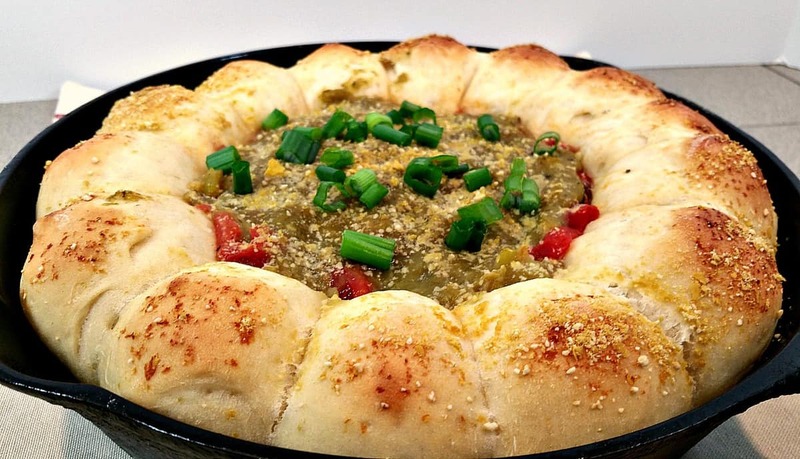 I was sitting at my desk having my lunch last week, perusing through those little FB Videos from Tip Hero, and I came across this little gem for Pull Apart Rolls with a Spicy Green Chile Bean Dip. I thought, “Oh man, I gotta make this!” And I’m so glad I did! Of course I had to veganize the heck out of it to make it compliant…. Sound like a lot of work? It was – but the end result was SO good it was totally worth it. What I love about this recipe is now there’s nothing ‘processed’ – it’s all made from scratch. Now I have to tell you I used authentic Hatch New Mexico Green Chiles (that had been in my freezer). And as all you New Mexican’s know – the longer chiles are in the freezer….the HOTTER they become. So this dip most DEFINITELY had a zing to it! But no worries if you don’t have any Hatch Green Chiles – canned green chiles from the store with maybe a fresh jalapeño or two will work just as well. This Green Chile Bean Dip would be PERFECT for parties and potlucks and there’s so much room to improvise. Add a dollop of homemade sour cream, some black olives, maybe a slice or two of Avocado….. The Pull Apart Rolls are made using my basic Pizza Dough Recipe. Just like the one I used for my Italian Calzones. That’s it. That’s all you need for any kind of bread. No oil, no butter, no FAT. Add a Tablespoon of sugar to 1 cup of warm water and whisk to dissolve. Then add 2 ¼ tsp of Active Dried Yeast and stir. After 10 minutes the yeast should ‘bloom’, or get real bubbly. If not – you may have old yeast. Once the yeast slurry is ready, add in a tsp of salt (and sometimes I add ½ tsp of garlic powder and ½ tsp of Italian Seasoning) and about 2 ½ cups of bread flour. You can definitely sub in some Whole Wheat, but if you go 100% whole wheat you may have to add some more water. I do all this in the bowl of my stand mixer, then simply add the dough hook attachment and let it rip. When the dough forms into a ball and pulls away from the sides, it’s done. Cover the dough and let it sit somewhere warm to rise while we make the sauce. Saute about ½ a cup of onion and a few cloves of minced garlic in a little veggie broth until softened. Sprinkle on 3 Tablespoons of flour and stir to coat. It will get clumpy, but that’s ok. Let it simmer a bit until it just starts to brown, then slowly, a little at a time, add 1 ½ cups of veggie broth. Add ¼ tsp each of cumin, ground pepper, salt, and oregano and stir until bubbly. Wait until you add the chiles and then add additional salt to taste. Now add 1 cup of chopped Green Chiles and stir them in. I used some frozen Hatch Green Chiles I had in my freezer. I thawed them, cleaned them, cut off the stems, and de-seeded them, than chopped them up fine. I used a 1 cup Pyrex glass measuring cup and filled it to the 1 cup mark. Note: Fresh Green Chiles will leave an oil on your fingers…..PLEASE use gloves or wash your hand thoroughly after handling as this oil WILL BURN your eyes….. speaking from experience here….. If you can’t find Hatch New Mexico Chiles, you can use canned green chiles instead. The flavor will be a little different, and the heat level will definitely be milder, but you can add a minced jalapeño or two to spice it up a bit. The sauce should thicken quickly. I poured mine into a blender and pulsed it a few times to get a smooth consistency. Not too much – leave some chunks for texture. I use Rosarita’s Fat-Free Refried Beans. The regular version is made with lard – so definitely look for the fat-free variety. To spice up the beans I added 4 teaspoons of my homemade taco mix. It’ll only take you a minute to whip up a batch using common kitchen spices, and you’ll have some left over for future use. Plop the refried beans into a bowl and mash them down with a fork. Then stir in the spice mixture really well. On a well floured surface, work your dough until it’s no longer sticky and roll it into a log. Cut the dough into equal sized pieces and roll them up into little dough balls. You can see I simply placed them in a Cast Iron Skillet and placed the bean mixture in the middle. You can cut a piece of parchment paper to line the bottom and sides of your skillet so nothing sticks. To the top of the beans add a 4oz can of drained Green Chiles and spread to cover. Drain a 15oz can of Fire Roasted Tomatoes and add those to the top of the chiles, spreading evenly. Spoon about ¼ cup (or more) of your enchilada sauce to cover the tomatoes. A simple ‘egg’ wash can be made using¼ cup water, 1 Tablespoon Corn Starch, and 1 tsp Molasses. Brush this mixture onto the dough and then sprinkle with Vegan Parmesan. Bake in a 375° F oven for 20 minutes or until rolls have browned. You will definitely have more dip than rolls – and if your house is anything like mine – the rolls will go quickly. But that’s ok! Lots’ of dip left over for burritos, tacos, or homemade tortilla chips. These Pull Apart Yeast Rolls with literally melt in your moutht - if the Spicy Green Chile Bean Dip doesn't melt it down completely! Hatch Green Chiles really give this dip a kick! Do we have to use “bread” flour or will plain white flour be okay to use? Either – I like bread flour for it’s higher gluten content. I just read this now, 6 months later, thanks chuck, but now I have to go and make that recipe! Can this be done in a cake or pie pan instead? Or just on a cookie sheet? I know the cast iron skillet will hold the space well, but use what you have. Give it a try.